Baba Yaga is an ambiguous and fascinating figure. She appears in traditional Russian folktales as a monstrous and hungry cannibal, or as a canny inquisitor of the adolescent hero or heroine of the tale. In new translations and with an introduction by Sibelan Forrester, Baba Yaga: The Wild Witch of the East in Russian Fairy Tales is a selection of tales that draws from the famous collection of Aleksandr Afanas'ev, but also includes some tales from the lesser-known nineteenth-century collection of Ivan Khudiakov. This new collection includes beloved classics such as "Vasilisa the Beautiful" and "The Frog Princess," as well as a version of the tale that is the basis for the ballet "The Firebird." Essentially, this book is a collection of Baba Yaga tales--the most in any English language compilation--with a six page foreword by Jack Zipes, a similarly long preface, and a 31 page introduction--for me the highlight of the book. It is much faster and lighter reading than the ever excellent Baba Yaga (International Folkloristics, V. 3) by Andreas Johns, a book YOU MUST own if you are at all interested in Baba Yaga. Very excellent but more scholarly in tone than this book which will appeal more to the more casual fairy tale reader while still satisfying some academic bent. There are 29 tales followed by an endnotes section and index, so the book is usefully compiled, too. The notes focus primarily on explaining Russian terms as well as describing variants to episodes in the tales. So many anthologies don't have as detailed an index as this one offers either. And the notes are a trivia or scholarly minded reader's dream. The book itself is hardcover with fine colorful images throughout--they are all glossed by Helena Goscilo. There were some images new to me. Goscilo's captions are excellent and leave one wanting to find even more Baba Yaga imagery. 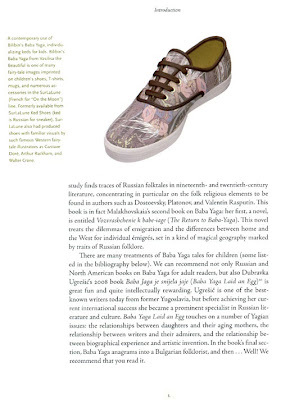 That's the shoe I created from Ivan Bilibin's illustration years ago on Zazzle. 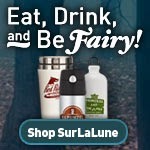 Zazzle no longer sells customized shoes (and their customer service quality has deteriorated) so I have ended the SurLaLune affiliation with them. Those shoes were awesome though. I don't own this pair--I wish I had ordered more styles for myself--but the pair I do have are quite thrilling. SurLaLune isn't mentioned anywhere else in the book, but that is neither here nor there. It's an excellent book and a worthy addition to my library. And, as a reminder, there is an annotated Baba Yaga on SurLaLune. There aren't many tales in that section since I decided to focus on AT-313H*: The Girl Escapes from a Witch. (I do need to update this to the ATU numbers.) I have recently updated the Book Gallery and Modern Interpretations pages which offer new titles that were not available when this book was published. This sounds like a great book, I am very interested in Baba Yaga. And that is an amazing shoe! I'm so glad this is finally out! I had been following the book on Facebook, and it seemed like they had a lot of setbacks--funding or something? I hadn't gotten word that they finally published it, will order asap!